It feels weird to be saying this at a time when sequels are far too prevalent, but while Ronin has its moments of brilliance during its short campaign, it ultimately feels very much like a proof of concept for a more generous and balanced game yet to come. A fun, if lightweight, stealth combat game. The turn-based fighting isn't perfect, but remains entertaining enough to be worth a look. Ronin is a challenging action platformer with vengeance on its mind. RONIN strives to achieve the level of masterful design of games like Gunpoint and Mark of the Ninja, but seems to have overlooked what made them so special in the first place. It has its moments of truly feeling like a badass, but they do not make up for the frustration of everything in between. 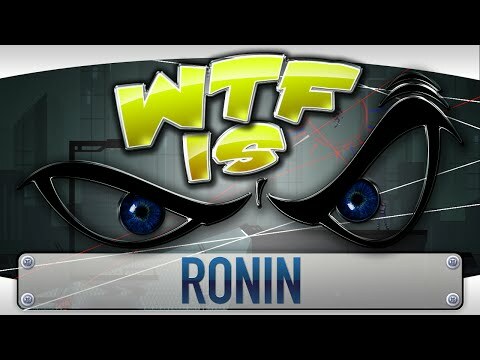 Ronin puts you the role of a motorcycle helment wearing ninja, who can dodge bullets and deliver death with every leap. However, the game's unforgiving nature tends to sap much of the fun out of vengeance. Ronin is potentially a really good game, but repetitive game play as well as a frustrating upgrade system makes it tough to finish to its conclusion. Ronin is fun to play and its strengths more than overcome its weaknesses. It lacks much by way of plot but sets a mood that creates the atmosphere it needs. It offers enough strategy and variety in its combat to overcome a somewhat short length, and invites players to playthrough again with its unscripted encounters. It has a fantastic little twist to the gameplay mechanic at the end that leads to a satisfying payoff in the final battle. Ronin is a remarkably average game. When it works, it's kind of fun, but there just isn't enough here to maintain interest, and it has nothing that we haven't seen before. Ronin has little plot to speak of, but is focused like it's own motorcycle helmeted avenger on a tight and tactical turn-ish-based combat mechanic. Looks a little like Gunpoint. Plays like Ronin. The strategy involved in each encounter really makes for a fun and satisfying game that both RPG and strategy fan can enjoy. I say give it a shot. Ronin is an extremely challenging platformer with a hidden ton of entertaining hours within. Strategic, thoughtful missions coupled with really cool player maneuverability make it one of those games you can't stop playing until you beat it. That said, I would like to see the developer introduce a level editor for those of us who want to build our own scenarios once we conquer the final boss. Altogether, Ronin creates an entirely novel experience that's given a solid boost from the sound and graphic design. While some frustration crops up in enemy-heavy territory, some trial-and-error in addition to strategic thinking is more than enough to get through even the tightest squeezes. While Ronin lacks in story, it excels with its combat system. Because of the enemy variety, player abilities and level layout, the combat feels adaptive and is incredibly fun to play. RONIN wants to be a thinking man's twitch slasher. It mixes intriguing visuals and a barebones but singular premise with an awkward interface and little variety. The first few missions are a template for the remaining game and there's little incentive to see it through to the end, much less replay it. RONIN is a difficult Turn-Based, Action Platformer that succeeds in creating a unique experience that demands your full attention.